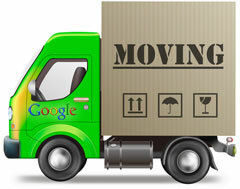 Home > Google News > Google Maps > Moving? Google Wants You To Close Your Business! I am moving my company in about a month and a half about 5 minutes down the road to a larger space. It is going to be a pain to move but we have no choice, we need a bigger space and the time has come. About a month ago we covered how Google will be introducing a We've Moved status on businesses that move locations. But when is that coming? Who knows. Right now, Google is suggesting that if you move your business, you should mark the business as closed and open a brand new business. Now that I am in the position of having to move, to mark my business as closed - a business that has been around since 1994 and at this one location for over ten years - is a major blow to me. We are not closed, we are just moving a few minutes down the road. We will have the same phone number, the same web address, the same staff and the same business - we are just changing the office location. If you mark the old listing closed, and create a new one, I can't say your reviews will definitely move to the new listing (I can't make guarantees with Places). You could try just editing the address on the old listing, if you're concerned about the reviews, but you might run in to address issues. I am sure some of you have been in this position, either for yourself or for clients. What do you recommend? Previous story: Poll: SEOs, Do You Trust Google?